HI. Please let me know, based on which standard, these spread sheets were prepared? Thank you very much. I have used this several times. It is helpful for single family residential construction. 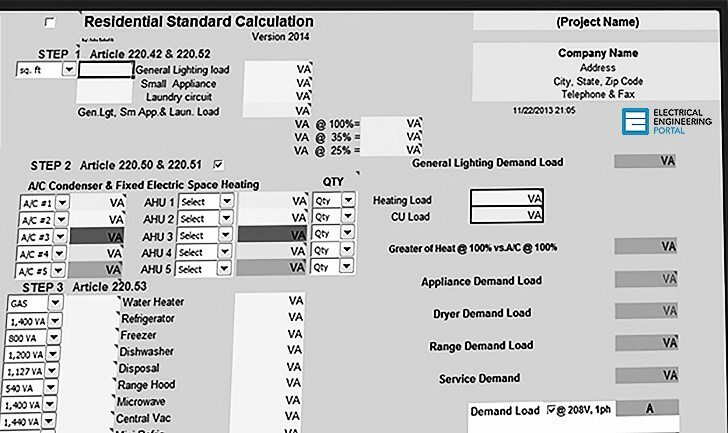 Also it is very useful as a learning tool: By changing various elements and observing how the total load responds, one can get a sense of what loads have the most effect on the overall demand. I did similar for industrial application and with automatic wire sizing. It would be great if that would be added in the future updates. Also, I could help make it an executable file and not excel dependent. i can not download excel file in box.any other source. I’m a new guy . Could you give me a direction to get the user guide for this spreadsheet ?